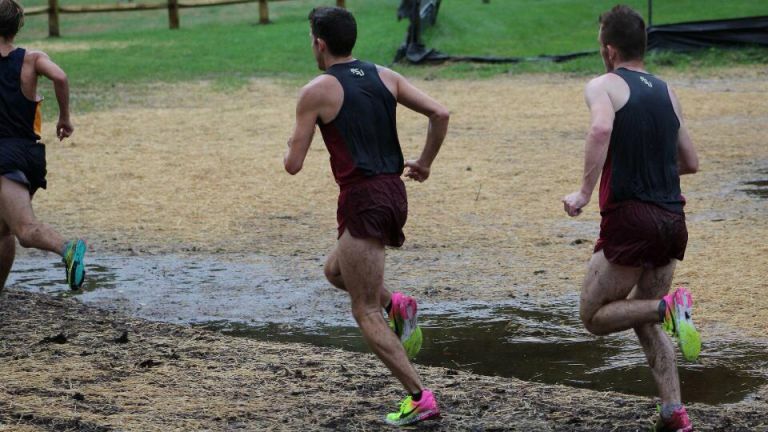 In the low contact arena of cross country racing, it can be refreshing to see elbows fly and some half-emaciated runners lose all motor control and go head over heels into a pool of mud. Now I’m not saying that I’m in the middle of a race waiting for someone to face plant, but every now and then when you’re hurting and wondering if you’ll survive the last mile, it’s nice to see other people in a worse spot than you. This kind of stuff doesn’t happen all that often, so when it does, it’s special. That is, until the person doing the electric slide across a sheet of muddy sludge is you. Then you’re just another statistic. 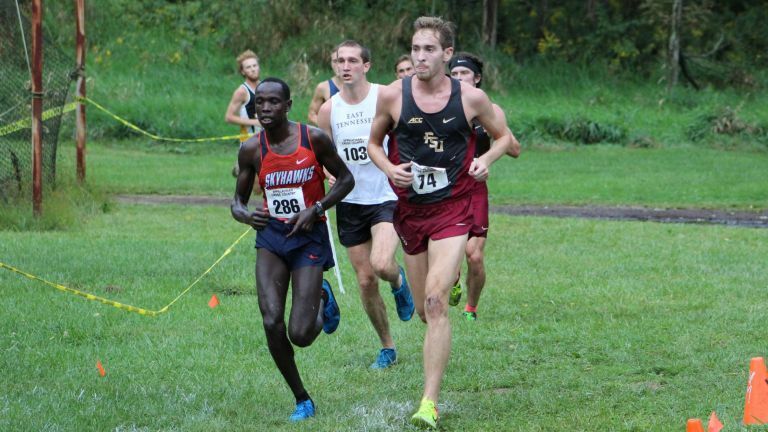 On Friday, after two straight days of rain on Appalachian State’s cross country course, David Barney and I became statistics. Or rather, I became a statistic and then forced him to join the exclusive club with a well-placed, yet accidental, splayed leg – or a beautifully executed slide tackle, take your pick. Let me just say this: cross country spikes are a thing of beauty. Invented as early as the 1850s, running spikes originally consisted of a pair of leather shoes (like the kind you wore to your first middle school dance that made you feel like you were walking around in flippers) with nails literally shoved through the soles. And really not too much has changed since then. Of course the Nikes we get these days are a little less crude and have colors that look like the 90s got sick from reruns of the Fresh Prince of Bel Air and threw up on a pair of shoes, but they basically serve the same purpose of giving runners traction. Our team didn’t wear cross country spikes during the Covered Bridge Open on Friday. In theory it was a sound idea – we didn’t want to beat up our legs too much, instead opting to wear cushier (spikeless) training flats, waiting to break out the newfangled Nike spikes for bigger races. 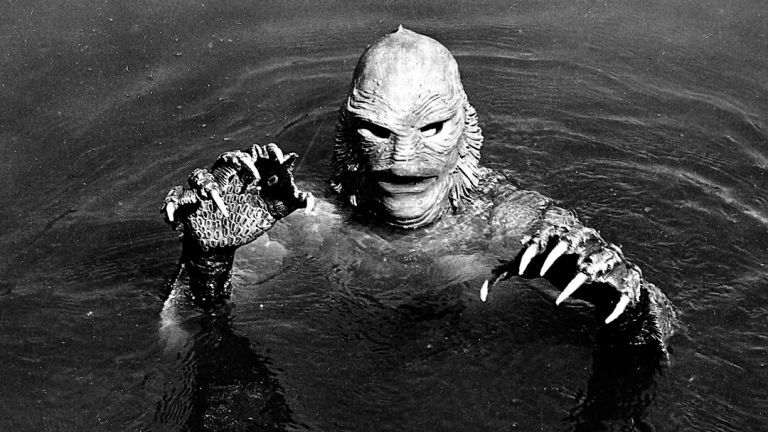 In practice, well, let’s just say that looking like the Creature From the Black Lagoon for the last two miles of the race wasn’t a fashion choice. It’s at this point in my ramblings that I’d like to formally apologize to David Barney and plead that I’m at least partially innocent. 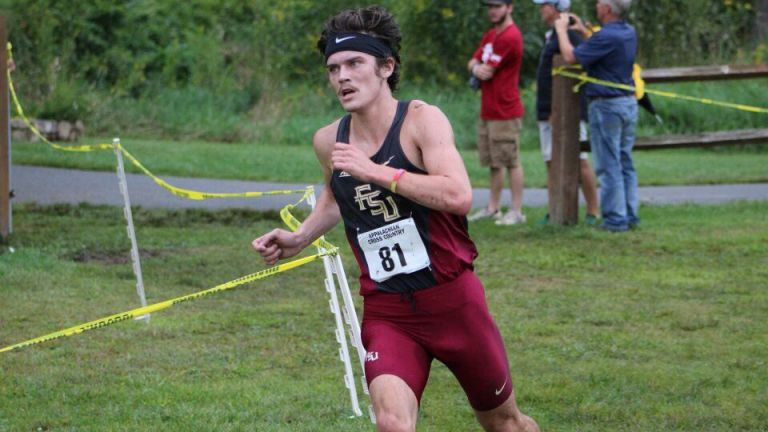 And yes, some may say, “Bryce you should have known the course enough not to take a wrong turn and then slip and take out your teammate when you realized your mistake.” Maybe I agree with that statement and maybe I don’t. But when I’m choosing between one unmarked trail of mud and another, and Barney is already beginning to put the hurt on me with two miles to go, I tend to not think straight. Besides, not much was lost besides a chunk of skin out of Barney’s knee from the collision. He still placed second and we still won as a team. And with the healing hands of training staff Armand Daigle and Danielle Fernandez, I’m told he’s made a full recovery. So I’d like to officially place an asterisk next to our relatively unconvincing winning score as we just edged out the second place team. We won on a slip n’ slide wearing the equivalent of greased up hospital booties. Okay, hyperboles aside, next time we step to the line in two weeks, I think we’ll be granted access to some cross country spikes. And while I’m still being hopeful, we may actually have good weather for race day in Blacksburg, Virginia, home to some turkey-thing known affectionately as a Hokie. For now, we head back to Tallahassee and say goodbye to Boone for some well-deserved high temperatures and high humidity. After all, what doesn’t kill you makes you stronger, isn’t that right Barney?